This is a brief history review of the "Vero Man" or possibly "Vero Woman". While a great many of the details on the story of the site still need to be filled in, we will, as is often said, start at the beginning. Links provided to additional information. According to the fossil record, anatomically modern humans appeared just under 200,000 years ago. Shortly after their coming out party the earth entered a long glacial period that lasted some 77,000 years. The human population that had grown to over 10,000 was cut down to a near extinction level of less than 1,000. This small group of humans appeared to have hunkered down at the southern end of Africa and survived until conditions improved enough for them to go forth and populate the entire planet. Today our population is approaching 7 billion. That is 7 followed by nine zeros (7,000,000,000). This is another story for another time. Humans had started extending their claim on this planet from about 123,000 years ago, but they still had to battle continual cycles of warming and cooling. While the last Ice Age has not officially ended, the periods of glacial ice coverage have come and gone several times. The last glacial period started around 70,000 years ago and peaked about 18,000 years ago. The warmer times that separate glacial periods within an Ice Age are known as interglacial periods. Currently we are in an interglacial period called the Holocene epoch, which began about 12,000 to 15,000 years ago with the melting of the glacial ice that covered the Northern Hemisphere. At the start of the Holocene epoch and maybe before, humans found their way to North America and then down to Florida. Even during the peak glacial ice coverage of North America, Vero Beach Florida was relatively warm or at least it was free of Ice. There is more than one theory about how humans made their way to Florida. The oldest theory has humans and animals crossing to the Americas by a route on our west coast via Alaska and then down the coast or down an ice free zone just east of the Rockies. However these Asiatic humans did not have Clovis technology. Clovis technology have been found across the Americas and appear related to the Solutrean technology of prehistoric Europe. A newer theory has humans first coming to the Americas via the frozen north Atlantic to Greenland and down the east coast of North America. In both cases it is assumed the humans were just following their prey and that the prey was just looking for greener pastures. Perhaps the prey was also fleeing their predators. Either way, these trips were originally believed to have started no more than 6,000 years ago. However, 90 something years ago this idea was challenged by a find in Vero Beach Florida. Human skeleton remains were found together with extinct mega-fauna such as mammoths, mastodons, giant saber-tooth tigers, bear-sized sloths, a new species of tapir (now called the Vero Tapir), and other large animals from the Late Ice Age or as scientists would call it, the Late Pleistocene period. In 1913 the Indian River Farms Company was dredging the Main Relief Canal in Vero Florida, in preparation to handle an expanding population. (It was not called Vero Beach until 1925.) The workers on this project kept seeing fossilized bones in the walls or banks of the freshly dredged canal. Some of these bones were presented to the state geologist, Dr E.H. Sellards. Dr. Sellards suggested that they also look for human bones during a visit to the site. In 1915, the first human bones were found in the undisturbed wall of the canal. 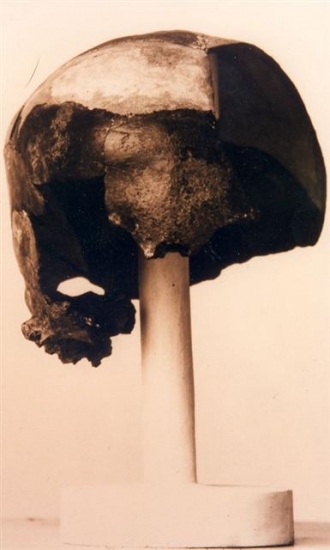 These bones became know as the “Vero Man”, although later testing suggested the original bones were from a female. 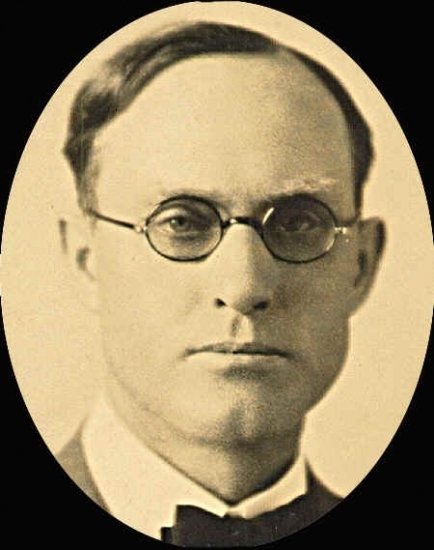 In 1916 Dr Sellards, working with Frank Ayers, Isaac Wells, and others found more human bones in the strata known as the Melbourne strata. The testing that was done later suggests that some of the bones were male and some female. 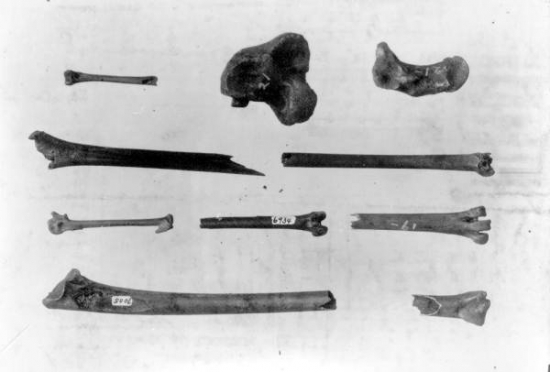 It was at this time that the finds were published and the controversy begins. Dr Sellards believed the humans lived side by side with the extinct Late Ice Age mammals, which puts them as living in Vero Florida over 14,000 years ago. This defied the conventional wisdom of that day which stated humans were in North America no further back than 6,000 years ago, based on other findings across the continent. The euro-centric view of that day held that humans were not in North America before 4,000 years ago. One antagonist to Dr Sellards views was Ales Hrdlicka, curator of the Physical Anthropology department at the Smithsonian Institution National Museum of Natural History. Ales Hrdlicka believed that the human bones were recovered in a very un-scientific manner and it can’t be conclusively determined that they were “in place” with the mega-fauna bones. He dismissed Dr Sellards finds saying the fossilized human bones are only a few thousand years old and were found in the Melbourne Strata because humans buried their dead. 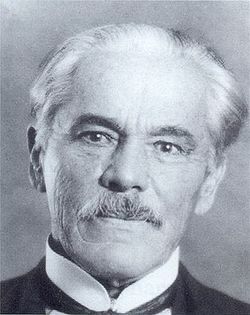 Ales Hrdlicka was an anthropologist while Dr Sellards was a geologist. Dr Sellards stated that the strata was undisturbed and properly in place and that it would not have been so, should the remains had been buried as Ales claims. It should be noted that Ales later pursued evidence to backup his theories that the first Americans entered the New World from Asia around 15,000 years ago. Today, the conventional view has it that humans did began the trek, on foot or by boat, to North America around 10,000 to 15,000 years ago. This is in part due to the Old Vero Man Site finds. Newer DNA testing is even suggesting a much earlier migration by at least another 10,000 years. This would easily allow for humans in Florida 14,000 years ago. However the controversy on how old the "Vero Man" was does remain. Carbon dating, as a technology, was not available before the 1950’s. 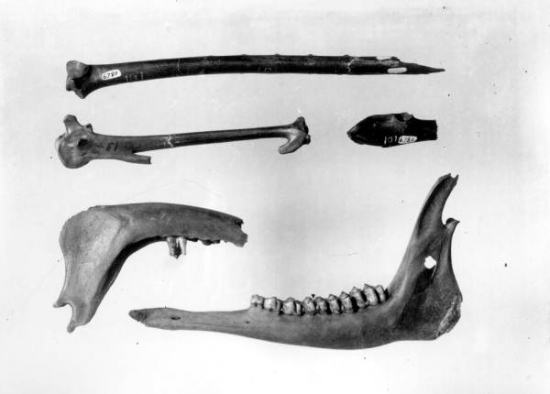 The original bones are listed as lost in 1945 while in transit from the Florida Geological Survey in Tallahassee to the Smithsonian Institution in Washington, D.C. We need new artifacts to test. There is a new push to get this controversy resolved before the site is buried beneath 200 tons of concrete. There is a planned project to build a new $850,000 storm-water-treatment facility on the site. Before this project can receive a state permit, the Vero Beach City Engineer Bill Messersmith is required to look for archaeological remains and he is open to receiving help. What is needed is a professional scientific excavation that even Ales Hrdlicka could not question. It is to this end that the Old Vero Ice Age Sites Committee (OVIASC) has been formed. OVIASC will work with the City of Vero Beach, the Indian River County Historical Society, along with experts and scientists. We seek donations to help fund this excavation, to study the recovered artifacts and fossils, and to properly display them for the education of all. The Old Vero Man site is already famous the world over in scientific circles. As an educational site and a tourist attraction we can make it famous to all. Adding to the public’s awareness of the site is a recent discovery by James Kennedy that a bone he recovered near the Old Vero Man site had an image of a Mammoth carved into it. This is a story told on another page of this website. 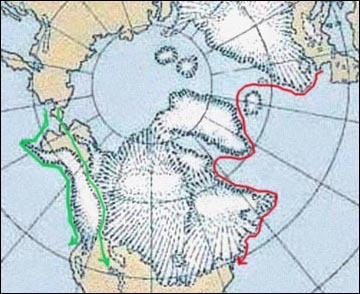 The following map illustrates possible ice age human migration routes to North America. Probable routes from Asia are indicated in green and from Europe are indicated in red. Map from THE SPALDING RESEARCH PROJECT. Image of a cast from original human skull fragments found in place with mega-fauna fossils at the "Vero Man Site". Photo taken by Vera Zimmerman (1996) at the Smithsonain Institution Paleintology Archives in Washington D.C.
Pictures taken by E.H. Sellards during his visit in 1916 to Vero. 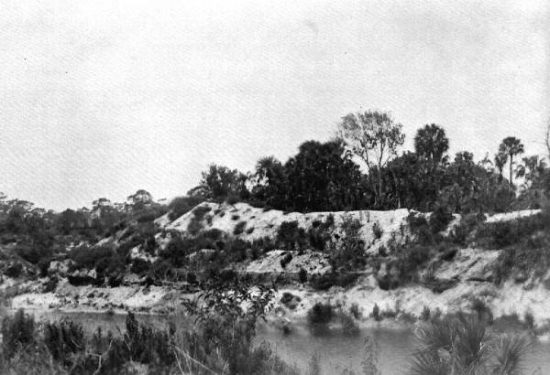 Pictures taken by E.H.Sellards of the fossilized bones found in 1914 at Main Relief Canal in Vero. 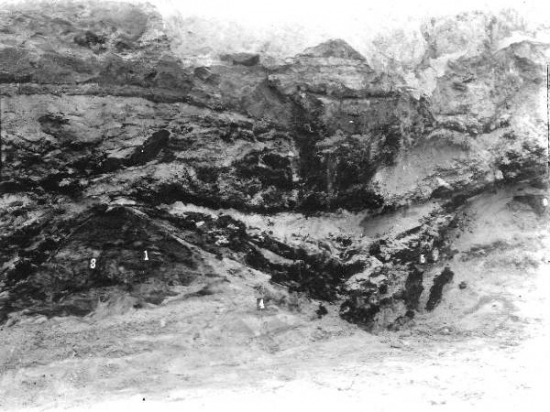 Some of pictures shown above are from Dr Sellards Annual Reports as State Geologist. He spelled out in great detail his findings from excavations done at the Old Vero Main Site along the banks of the Main Relief Canal just west of the railroad bridge. He first reported his findings in the Eighth Annual Report filed in 1916. This was after a major excavation that included many scientists from around the country and the world. See some of the newspaper articles listed below from 1915 & 1916. Extracts from his report concerning what he found during his excavations are available in two parts. First part covers the report. Second part covers the photographs he took. Open them both when reading as the report makes reference to the photographs. 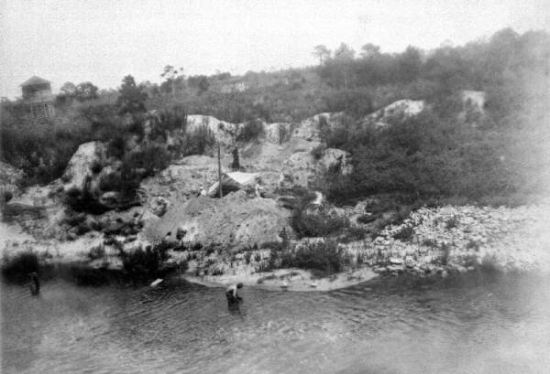 Dr Sellards provided some additional information in the Ninth Annual Report filed in 1917 about new findings at Vero Florida.